Over the past three months, the NZD/USD pair has been trading within the long-term downward trend, having lost more than 500 points during this time. The weakening of NZD is due to soft monetary policy and a decrease in the RBNZ interest rate. In addition, the course is negatively affected by poor business confidence data, construction, and labor issues. In the meantime, USD is strengthening due to positive releases on the labor market and key indices. Yesterday, the pair traded at the levels of 0.6510, 0.6500, but after the publication of negative data on the US Producer Price Index, the pair strengthened to the level of 0.6565. Today and on Friday, investors are waiting for key US releases: data on inflation, Retail Sales, Industrial Production and key indices. The main scenario is a decline of the pair to historical lows of 0.6350, 0.6240 in the medium term. In the short term, there is no factor that could significantly strengthen NZD expected, and it will continue to fall against USD. Technical indicators confirm the forecast, giving a strong sell signal: the volumes of MACD short positions are increasing, Bollinger bands are directed downwards. Resistance levels: 0.6565, 0.6610, 0.6650, 0.6710, 0.6770, 0.6830. Support levels: 0.6545, 0.6510, 0.6490, 0.6430, 0.6350, 0.6240. 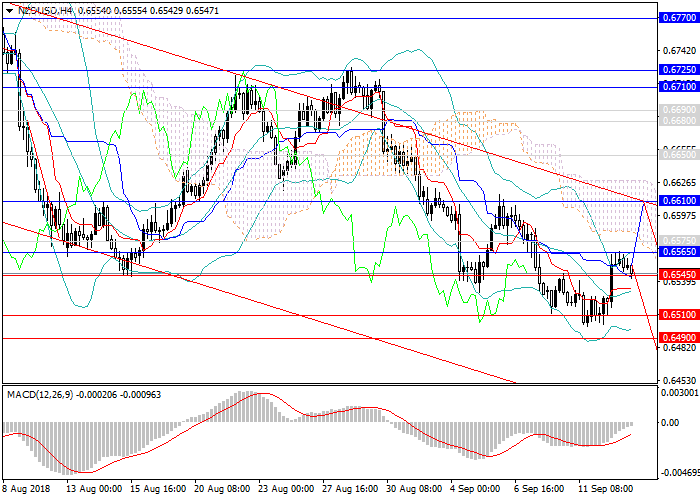 It is relevant to open short positions from the current level with the targets at 0.6430, 0.6350 and stop loss 0.6640.